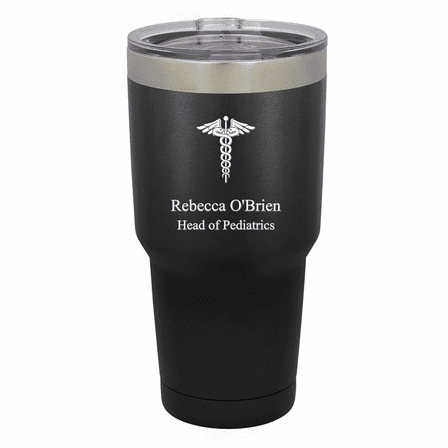 This tumbler is a great gift idea for friends, co-workers, and those who have helped you through illness or injury! It's a black stainless steel Polar Camel tumbler, with double-wall vacuum insulation that provides 2 x the heat/cold resistance of plastic tumblers. 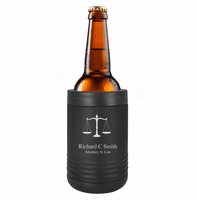 It features a clear plastic lid, and a narrow base that fits most cup holders. A Medical Emblem is laser-engraved through the black finish, and below it can be personalized for free with up to 6 lines of text. The tumbler comes packaged in a gift box. This was a wonderful gift, and the matte finish is super. ConsNeed more colors, besides black. It would be gorgeous in red.